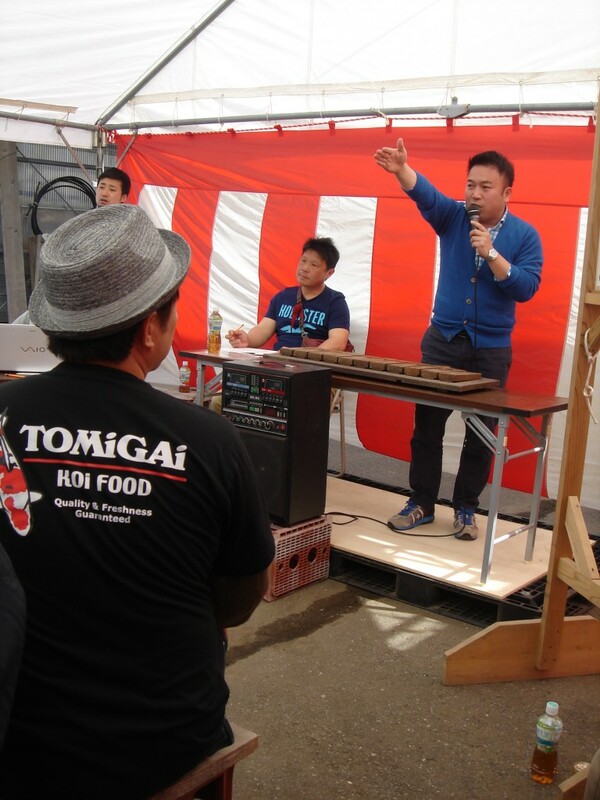 Tani Fish Farm Auction Day! Perfectly blue skies and Sakura trees in full bloom! 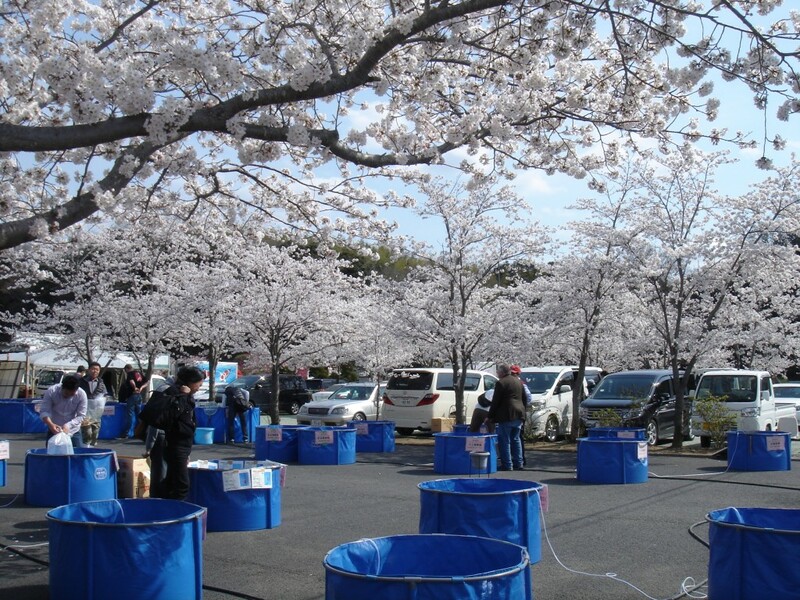 When we arrived, several of the breeders were already there busy releasing the Koi that was put aside for auction the previous day. 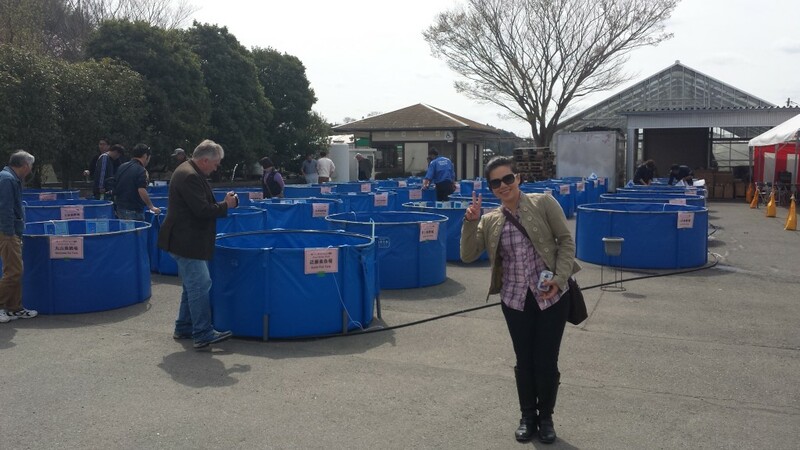 Each of the breeders got their own vats and after they finished releasing their Koi, they were all quick to see who else needed help in releasing their own fish. All the Koi that were slated to go into auction had been previously selected, photographed and documented so that they might be published online for everyone to see. This was so that even potential bidders from out of the country had a chance to participate in the auction as well through their chosen dealer. 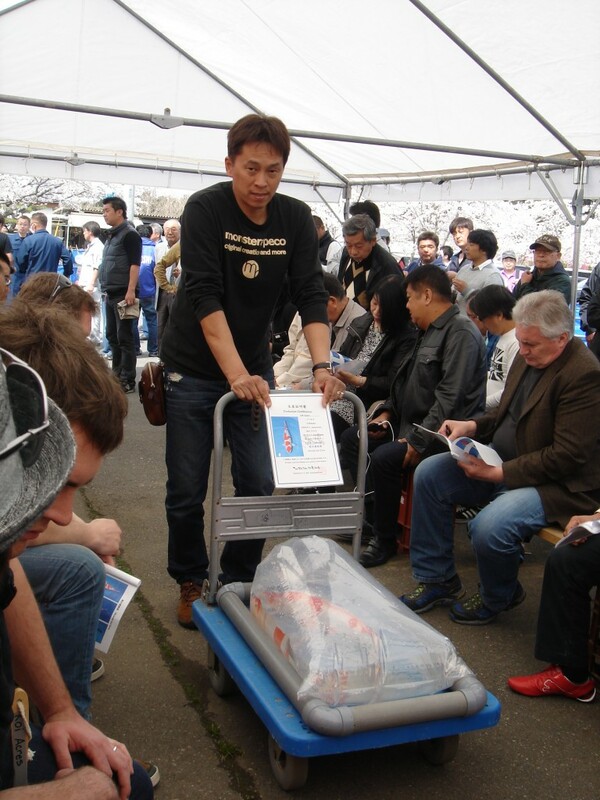 The auction wasn’t starting until 1 pm, so most everyone was crowded around the on-the-spot sale tanks, hurriedly trying to purchase the best Koi lest someone beat them to it. Papa was eager to select some of the best Koi to bring to Manila for the Grow out contest so he enlisted the help of myself and Devin to scout the perimeter for Koi that we felt would do well for the Grow Out event. It wasn’t long before we managed to wrestle some of Dainichi’s special-complete-with-certificate Koi from him. 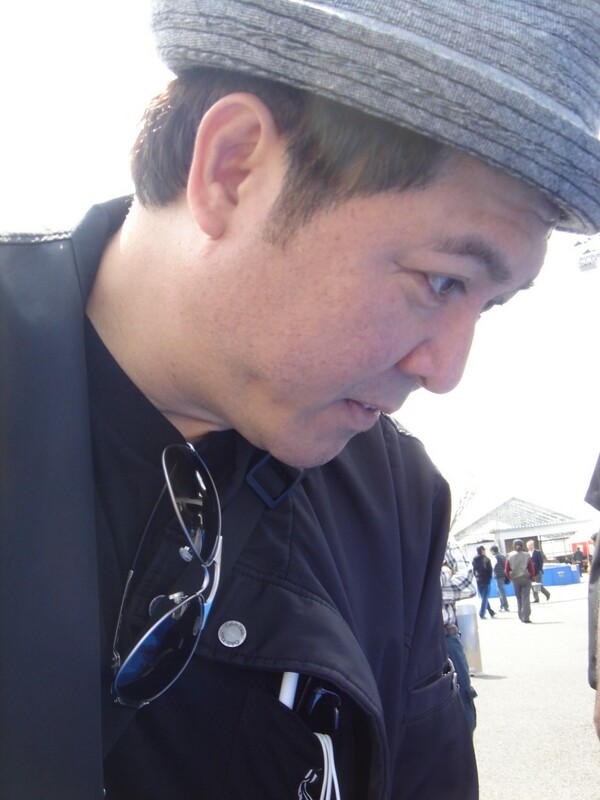 Futoshi was so accommodating and in support of our event, he even gave us his special pick from among the Koi. Woot! Woot! 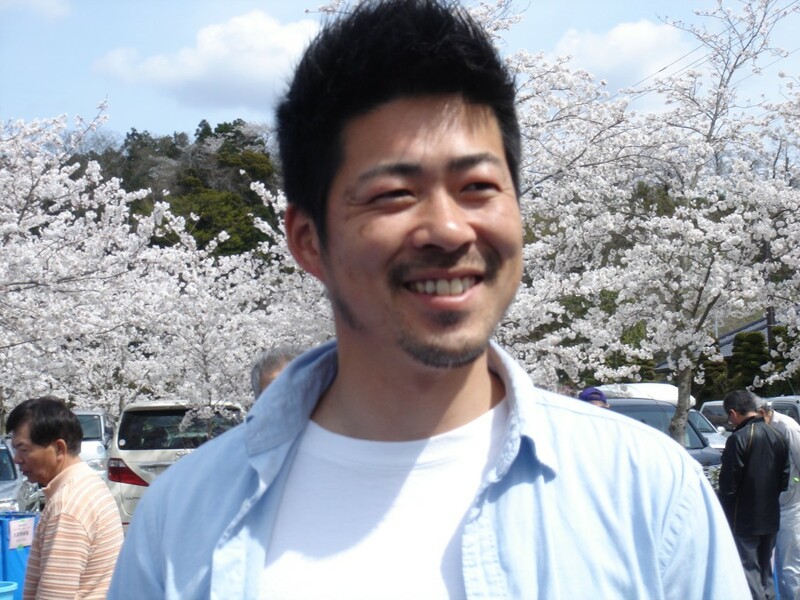 We also ran into the charming Masayuki Sekiguchi, who had some awesome Showa for Sale. They were all the perfect size and quality for the grow out contest that Papa decided to get the entire tank! 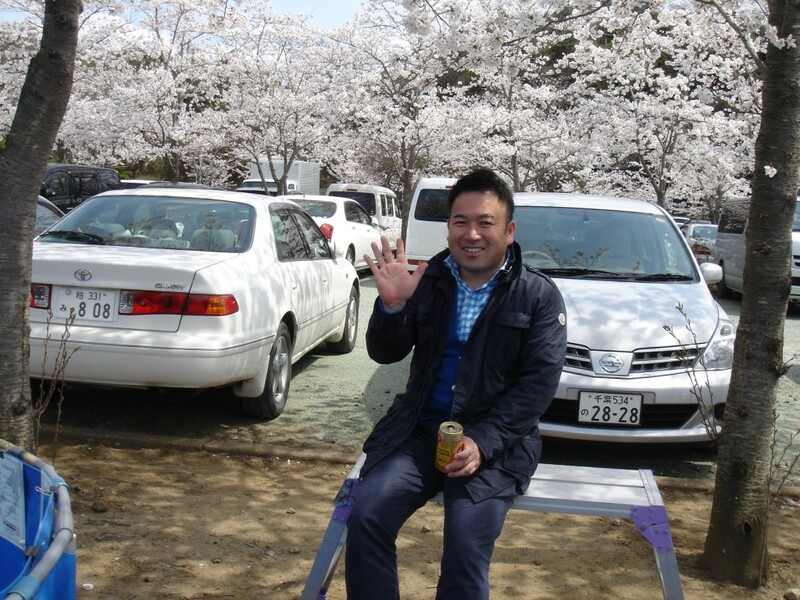 It wasn’t long before I ran into the famous Kentaro Sakai of Sakai Fish Farm who was quietly sitting under the shade of the Sakura Trees enjoying the day. Of course I couldn’t resist the chance to bother him, which he didn’t seem to mind! 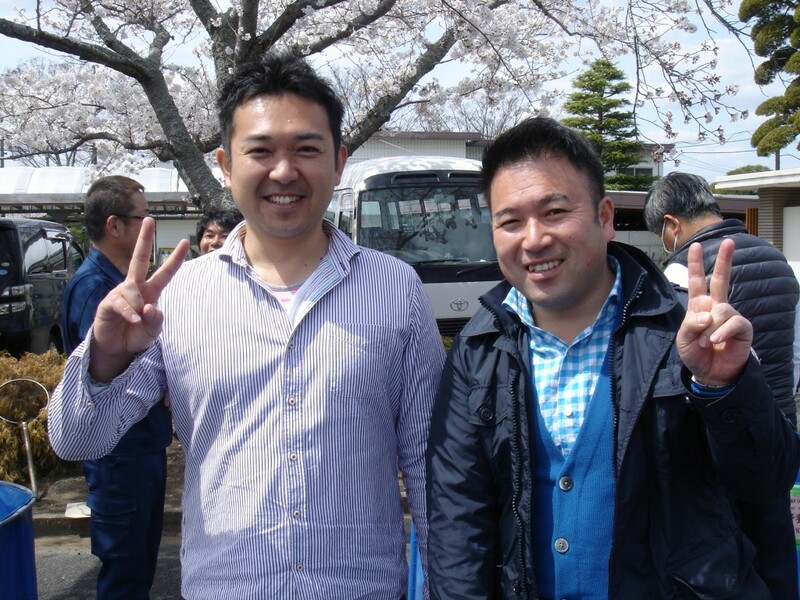 To the stranger, Kentaro Sakai has quite the intimidating appearance. Coupled with the fact that he is second-in-command to one of the largest and most prestigious Koi Farms in the world, he can be quite daunting to approach and speak to. But what really lies beneath that reserved exterior is not only a most genuine spirit, but also a very fun-loving and candid character. He was supposed to be bringing in three fish for the auction, but what we found in his tank was two absolutely gorgeous fish, but only two. “Where’s the other fish, Kentaro! ?” Papa asked him. “Not here. Didn’t bring. Only certificate.” was his reply. He then held the certificate in front of him with his two hands, which he turned to the right, and then to the left. He can’t be serious… can he?? Isn’t that so cute? 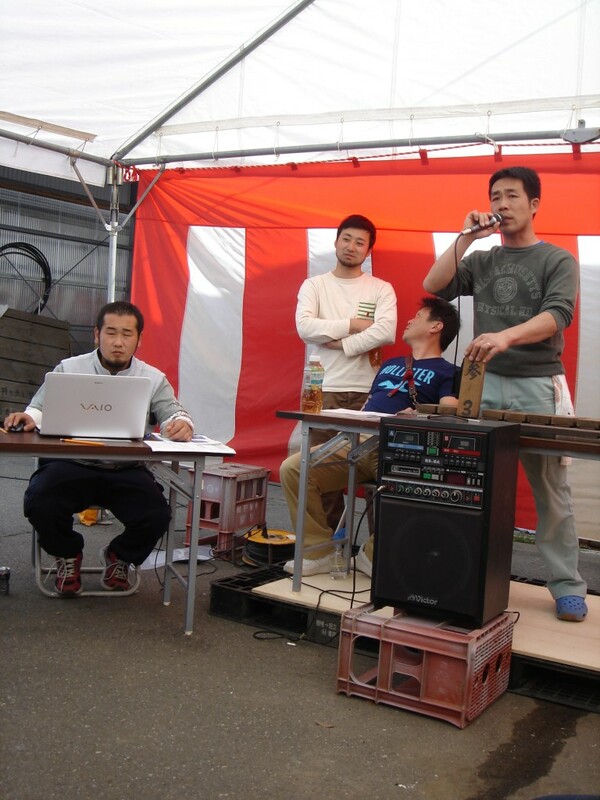 After a wonderful lunch of Japanese style curry and rice, auction was about to begin. 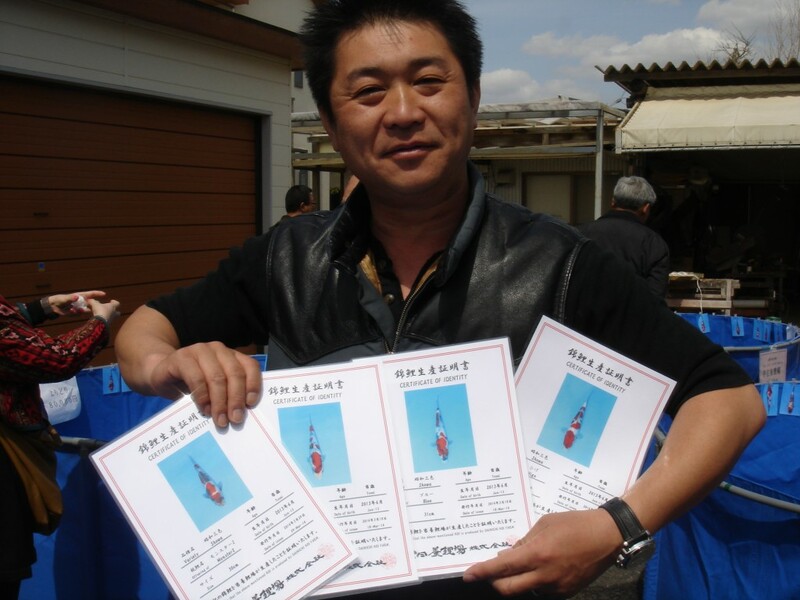 Auctions in Japan are the perfect opportunity for you to get some of the best or most desired fish that a farm has to offer. 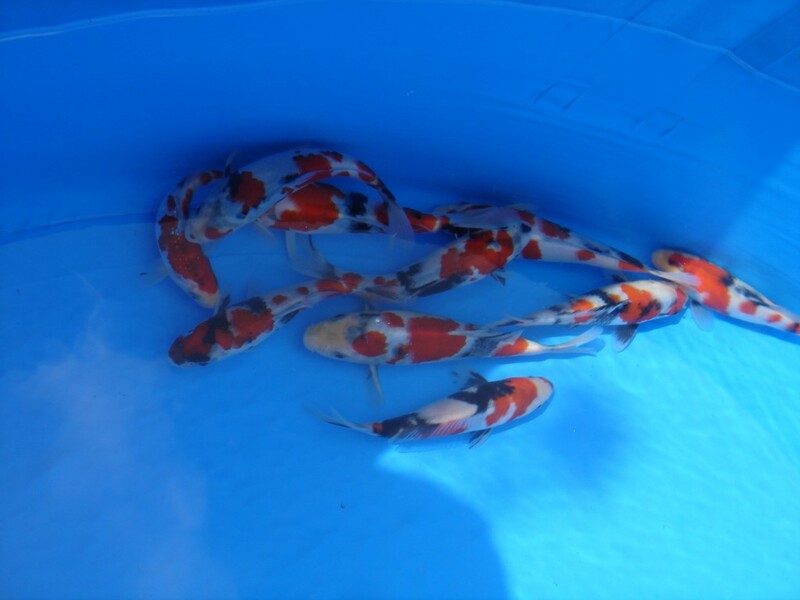 The Koi that go into auction have been carefully selected just for that purpose, and for the most part aren’t available for sale when you visit the breeder’s farms. 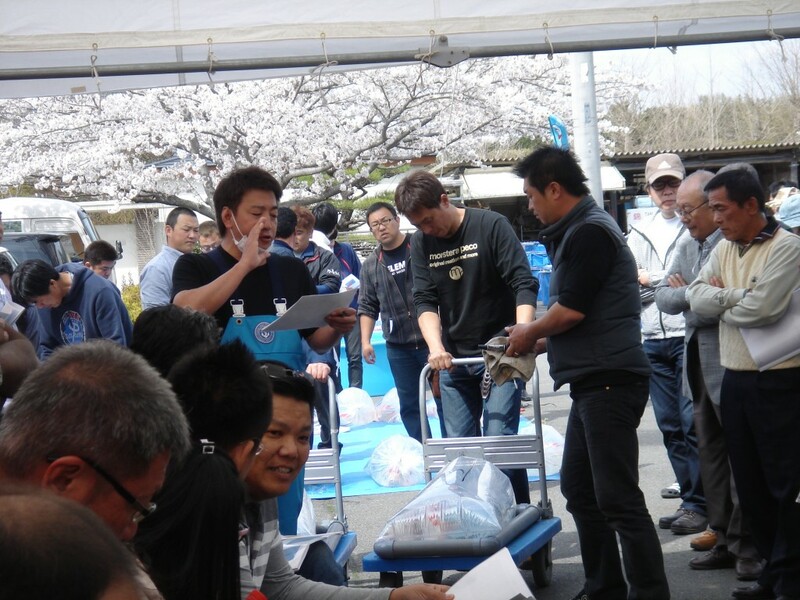 Most auctions are open only to the Koi professionals, and hobbyists must bid for Koi through the professional that they are most comfortable working with. 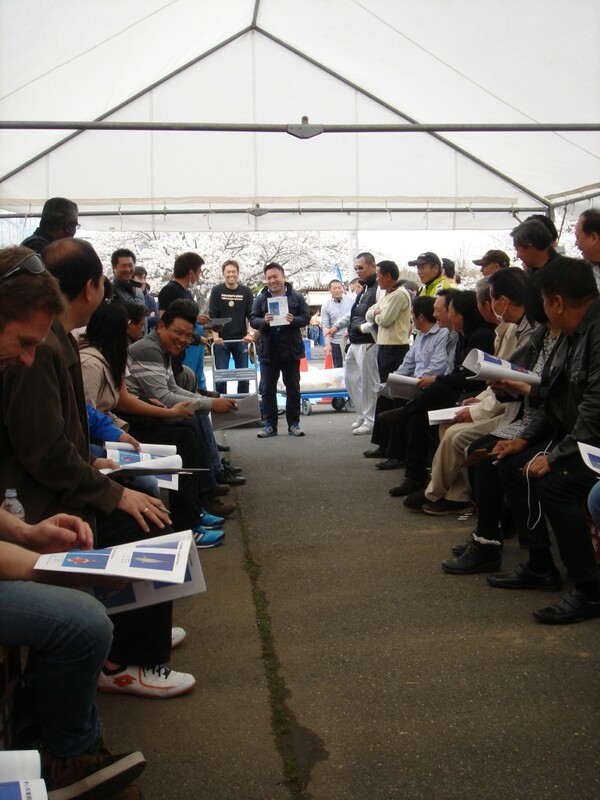 Skill and knowledge come heavily into play at an auction, and experience helps a lot too. The tension and excitement of competing for a Koi can sometimes get the better of the bidders so it is imperative that the value of the Koi and it’s future potential is kept in mind so as not to pay more money than what the Koi is truly worth. But skill and knowledge aren’t the only things to consider when selecting a professional to bid through. If the professional has managed to build a good rapport among his or her fellow professionals, then there is a good chance that they will be generous and bow out of bidding for a Koi that you may intend to buy. So everything about Koi is about relationship: the dealer’s relationship with the breeder and the hobbyist’s relationship with his or her dealer. It is the Japanese culture that they all help each other progress in their chosen field and they have built the industry to work in the same way through mutual trust and respect that can only be earned by putting in the time and effort. It was 1 pm and the auction was underway! 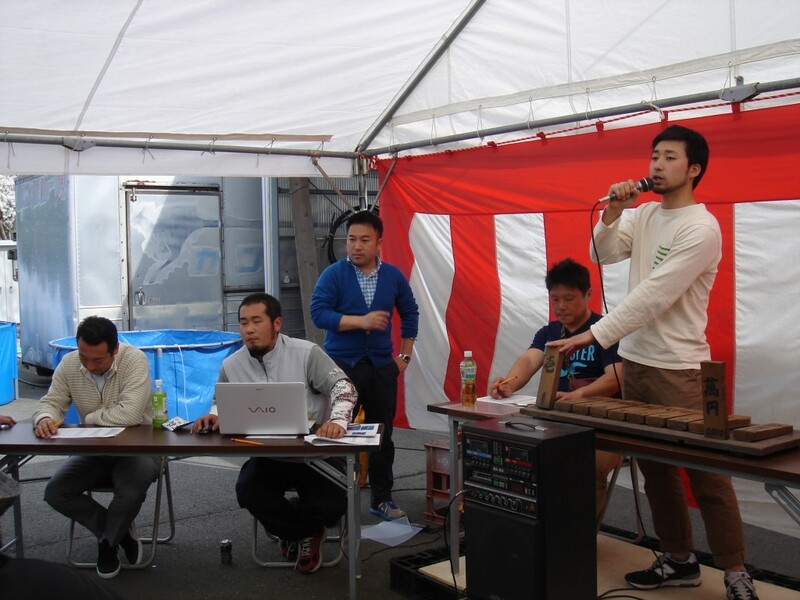 Before the fish enter the tent, we had Mitsunori Isa calling out the Koi ID number, breeder and starting price both in Japanese and English. Futoshi Mano would facilitate the bringing in of the fish and assist in identifying which fish was what and where it was going to go. It made for fun times when he had trouble saying some numbers in English…. 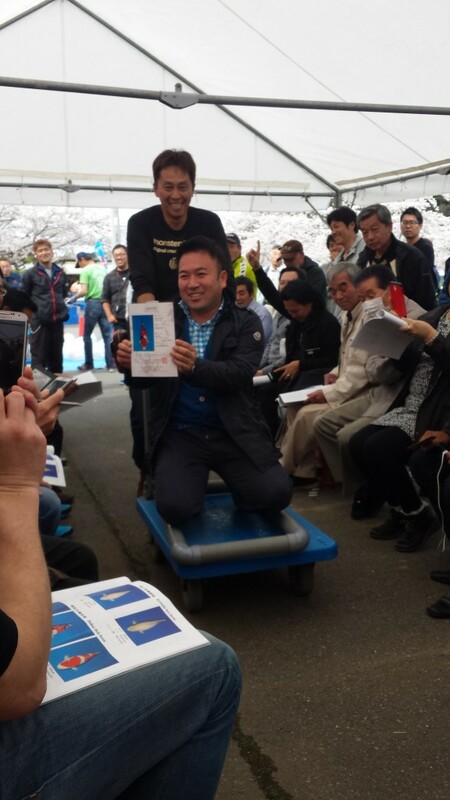 The Koi was then wheeled in and people would start placing their bids. There were three auctioneers that day, rotating among each other when they either had something else to tend to or if their voices needed a rest. Using a row of wooden blocks with both Kanji and English numbers written on it, the auctioneers would raise or lower each block depending on the amount that they were currently at. Each wooden block is raised an lowered with great emphasis, making quite a startling noise that can overwhelm and potentially confuse if you’re the jumpy type. Naturally, the wooden Japanese style of keeping track can be quite baffling to the foreigner so they assist the non-Japanese guests by having a board that contains all the numbers written out in English numbers and designate someone to hold a pointer and guide everyone as to what the current bid was. Yup, he was serious. This definitely broke the air of brevity and everyone immediately crowded around Kentaro to get photographs and cheer him on. It made for great fun and Kentaro gladly obliged the amused Koi paparazzi. 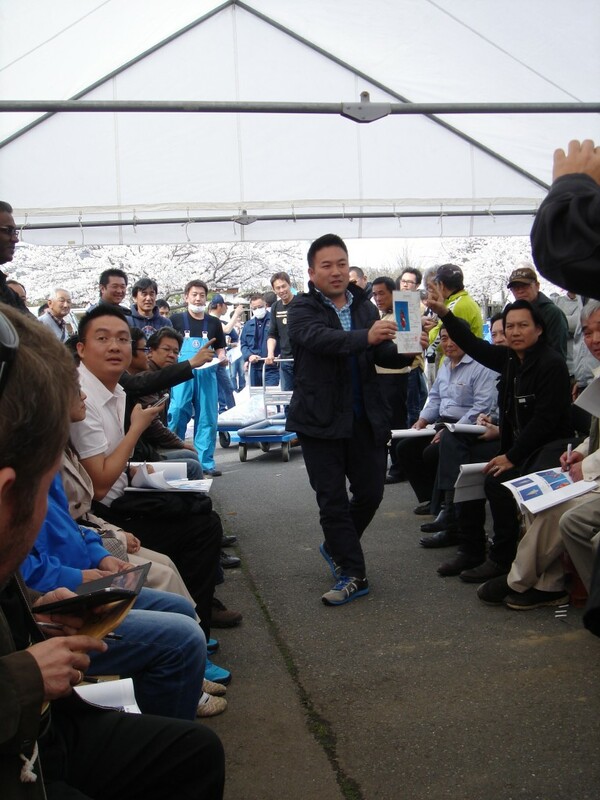 It was nearly four when the auction ended and after the last fish had been presented, everyone stood up to make the arrangements for the shipping and/or holding of their Koi.